You will not find anything remotely like this WEIGHT LOSS SYSTEM anywhere on the internet. How do I know this? I know this because I WROTE it! I am now handing it lovingly over to you. At last you have found your SOLUTION! The 68 minute CD included in The Slimmer You NLP Hypnotherapy Weight Loss System© was selected for its versatility, as it is the one which was created to be listened to during the day. This means at the end of the CD Session you are not encouraged to fall asleep, but are brought back to full awareness ready to continue with your day. Having said that, the large majority of people still do fall asleep during this recording anyway so we recommend you set an alarm to wake you up while playing it during the day. As mentioned in Track 1 - the Introduction Session - it really doesn’t matter if you fall asleep during any of our Hypnotherapy Sessions as the recordings are not really for your conscious mind and as your subconscious mind never sleeps it will still hear the entire recording ensuring you still achieve your desired results. The Slimmer You NLP Hypnotherapy Weight Loss System© CD Consists of Track 1 - Your Important Introduction of 17 minutes which leads into Track 2 which is your full 51 minute NLP Hypnotherapy Session recorded in rich CD format (or mp3's if you request the mp3 Disc). As The Slimmer You NLP Hypnotherapy Weight Loss Session© recording contains very SOFT professional quality brainwave entrainment tones. Please read the warning at the end of this page. I Promise This Isn't a Diet Book© by Tina J Costello is a fabulous 120 page book which has now been included in the The Slimmer You NLP Hypnotherapy Weight Loss System© and everyone just loves it. As the title suggests, it isn't a diet book. The Slimmer You NLP Hypnotherapy Weight Loss System© is NOT a diet. The research compiling this book was massive and the result is a fully comprehensive book containing actual foods which when eaten will burn the fat away for you as you go about your normal day. It contains various chapters on different 'types' of these foods, whether they be fat burning foods, negative calorie foods etc, and even age erasing foods. Each chapter supplies information about what these foods are and then charts them. As you look through each chapter you will discover foods which are on all the lists, and at the back of the book it gives you a 'Shopping List' Chart which you can match your favourite foods which appear in each chapter together and prepare a 'Shopping List' that will just blast your fat away! Needless-to-say there is other wonderful information included within this book, but the reason everyone loves it so much is because all the work has been done for you. Again ... this is NOT a diet book. It contains food you already eat. You will just be eating more of the ones mentioned to fast track your weight loss. This book has become a bible to everyone on The Slimmer You NLP Hypnotherapy Weight Loss System© and we know that you will appreciate its great value too. FREE GIFT - 1 Vitamin, Mineral & Food Nutrition Charts This comprehensive book was put together to complement I Promise This Isn't a Diet Book©. It is a wonderful reference book which you will flick through often; especially after you discover within I Promise This Isn't a Diet Book© which vitamins, minerals and foods will actually lose the weight for you! You will discover this book in another folder on the CD. 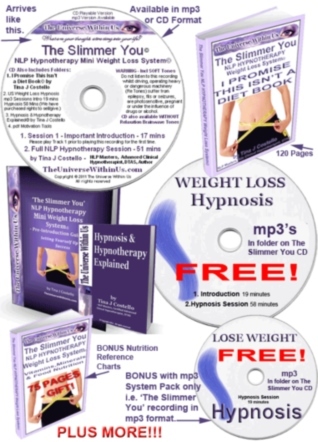 FREE GIFT - 3 BONUS IN mp3 FORMAT PACK ONLY Lose Weight Hypnosis Session This is a NEWLY INCLUDED BONUS which is available when you buy The Slimmer You’ NLP Hypnotherapy Weight Loss System mp3 BONUS PACK. It is another mp3 gift and the reason it can only be included in this mp3 format Pack is because it wouldn't fit onto the CD of The Slimmer You NLP Hypnotherapy Weight Loss System© in CD format - it is already so crammed full of goodies! You will discover this mp3 in folder on the CD. It is another US recording which we have purchased the rights to sell or give away as gifts. As you are also getting this recording for free, I highly recommend you use it. We have also seen this recording being sold for full price on eBay. FREE GIFT - 4 The Slimmer You NLP Hypnotherapy Weight Loss System - Setting Yourself Up For Success© This small eBook will be email out to you with your receipt to help prepare you prior to your CD/mp3 Disc arriving. It is important that you read through it and start on your weight loss journey with excitement and passion. Don't worry, it isn't going to suggest any drastic action. FREE GIFT - 5 Hypnosis & Hypnotherapy Explained© by Tina J Costello In another folder on the CD you will discover an eBook that will answer any questions you might have about Hypnosis and Hypnotherapy which might not have been covered in Track 1 of The Slimmer You© CD. It is a comprehensive little book of over 50 pages, and a good read. It is not as boring as the name implies. Honestly! This eBook will be found in yet another folder on your CD. FREE GIFT - 6 Some pdf Tools To Keep You MotivatedThese pages aren't really gifts, but part of the FULL 4 CD 'The Slimmer You' NLP Hypnotherapy Weight Loss System© which we decided to include with this CD. They don't require a lot of action on your part, but are an important mental part of the System. Guess where you will find these? Yes. In another folder on your CD. You will GENUINELY look forward to your NLP Hypnotherapy Session each day as each session brings with it NEW experiences as your imagination takes you on different healing journeys. At the end of each session you will feel happy, proud, strong and EMPOWERED! We have sold 1000's of these. Why waste valuable time while driving, sleeping, etc when you could be adding to your weight loss goal? 1. The Slimmer You Slimming to a Beat© CD by Tina J Costello - 53 minutes - consists of 230 softly spoken weight loss and exercise promoting affirmations which are echoed even softer to become 460. You can barely hear them behind the up-tempo synthesised music and they are not designed to be the focus of your listening. Woven even deeper into the recording are weight loss subliminal messages. This recording is perfect to be played softly in the background while doing almost anything, for example, driving, exercising, housework, reading, etc. It doesn't require you to be in a quiet relaxed state of mind or passive. It doesn't even require you to listen to it. Your conscious mind could be engrossed in a book, television program or driving while your subconscious mind receives the benefit from the affirmations and subliminal messages. 2. The Slimmer You Slimming to Sleep© CD by Tina J Costello - 53 minutes - contains the same 230 softly spoken weight loss and exercise promoting affirmations which are echoed even softer to become 460, plus the subliminal messages. With this recording you can clearly hear the affirmations though. The mix of the recording is different to The Slimmer You Slimming to a Beat© because the focus of this recording is to lull you to sleep. It contains a beautifully relaxing background music track as well as the calming sounds of the ocean at twilight. It is truly a piece of heaven which will have you nodding off to sleep in no time. The focus of the recording does not need to be consciously on the affirmations and the majority of people just enjoy listening to the sounds of the relaxing music and the ocean. When you do fall asleep your subconscious mind will continue to listen to the affirmations and subliminal messages. You will awaken in the morning feeling rested, refreshed, and empowered to continue on your weight loss journey. The affirmations and subliminal messages have been especially written to promote a healthy and strong self-image as well as a genuine desire to exercise and fuel your body with tasty and healthy foods. And they will be doing all of that while you are sound asleep! 3. FREE GIFT US Lose Weight Hypnosis Session mp3 - 19 minutes - in a folder on the CD. We have purchased to rights to include this recording, but the rights do not come with this gift. The heroes of this listing are The Slimmer You Slimming to a Beat© and The Slimmer You Slimming to Sleep© recordings, but it never hurts to use as many tools as possible within your weight loss journey.